It must be time for commencement as all of the buildings are getting a face wash…the tulips are gone from the corner replaced by red begonias and all of a sudden I can park wherever I like…While working in a folder of pictures about commencement, I came across some other images that I just have to share. This picture is of the class of 1924 as freshmen. All gathered in front of Center Hall for the group picture. Among this class is Pete Thorn (the first and last 16 letter man), Irwin “Tiny” Knee (mentioned before on this blog http://blogs.wabash.edu/dear-old-wabash/2011/01/05/irvin-%e2%80%9ctiny-knee%e2%80%9d-w1923/), a constitutional scholar (Winfred Harbison), and one future president of the Board of Trustees – John Collett. Also joining the newest class at Wabash is a very large St. Bernard dog. This is a photo of the men of the class of 1925 posing for class day on the arboretum side of our campus. 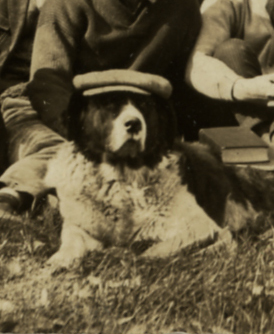 In this photo, the boys have grown to men and there, right in the middle of it all…the dog, now sporting a man’s hat. Again, a zoom of the dog and we can see his hat and his devil may care attitude. Although I can’t be sure that this fellow is a Phi Delt, that house has a long history of having a St. Bernard as their house dog. Most of the houses had a house dog and years ago these dogs wandered into and out of classes at their pleasure. Often times this was to the delight of students, as they offered a break in the lecture for that day. 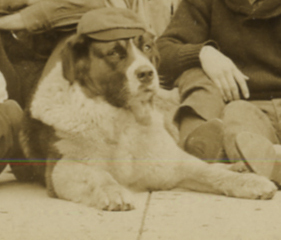 There are many dog stories here in the Archives, but few come with such excellent pictures!